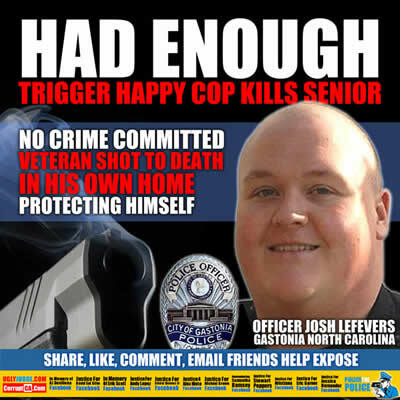 A North Carolina officer Josh Lefevers shot dead a 74-year-old man whose concerned family had called the police and asked to check on him. Officer Josh Lefevers arrived at the home of James Allen just before midnight on Sunday morning and entered the residence when Allen approached him with a handgun and refused to put it down, police said. There is no evidence Allen knew who Officer Josh Lefevers was and it was almost midnight. The officer first went to Allen’s home around 10pm after relatives called the Gastonia police for a welfare check but there was no answer at the door. Officials called nearby hospitals but could not locate Allen. Neighbors said they hadn’t seen him since Friday, and his car was parked at home. However Allen had just had open heart surgery so it should have been expected he was not mobile. Allen had just recently undergone a medical procedure and his family was concerned for his well-being. Police then called the local emergency services and fire department to assist with what they believed was a possible death inside the house. After another knock went unanswered the fire department helped Lefevers enter through the back door of Allen’s home. Gastonia Police Chief Robert Helton said officers were concerned Allen was inside and ‘in need of emergency assistance.’ So they executed him. Lefevers announced he was entering the house and then saw Allen pointing the gun at him, Helton said. Did the officer ever consider a senior was hard of hearing? Lefevers was hired by the department in 2012 and serves on the patrol division.